Operation Dauntless is a moderately complex wargame that covers the actions of the British 49th Infantry Division a.k.a "The Polar Bears" near Caen during Operation Martlet (called Operation Dauntless by the British at the time of the battle). Opposing these lads are elements of the 12th SS Panzer Division "Hitlerjugend" (Hitler Youth) and Panzer Lehr- elite panzergrenadier units. The goal of the British division is to seize the town of Fontenay, then press onward to secure the high ground near Rauray in time for the impending Operation Epsom, to be launched the next morning. The game by designer Mark Mokszycki uses the same system as Red Winter, his game on the Battle of Tolvajärvi from the Russo-Finnish Winter War of 1939. The scale and key mechanics of Operation Dauntless are the same as Red Winter. Proposed future games in the series include Red Winter 2: The Battle of Ägläjärvi, Guadalcanal Land Battles, Scottish Corridor: The Battle for Cheux, and the Breaking the Panzers expansion for Operation Dauntless, covering the German counterattack at Point 110 (all are working titles and subject to change). The scale is grand tactical- 90 minutes per game turn, 425 yards per hex, and mostly company sized infantry units with platoon sized armor units. Gone are the Winter War specific rules such as ski movement and night raids, and in their place we have a more detailed armor/anti-tank subsystem. There are lots of tanks on both sides in this one! 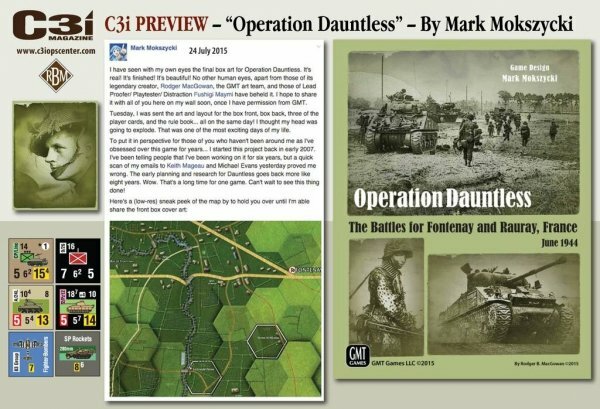 Special rules for Operation Dauntless include: British creeping barrages, hidden German unit setup, the 12th SS Fanatical Defense Table, British sabot ammo, assault guns, combat engineers, troop transport, British air strikes, British "funny" tanks (including the dreaded bunker-busting Churchill AVREs with their 290mm "Spigot" mortars, Sherman Crabs, and the flame-throwing Crocodiles), infantry anti-tank weapons, German ammo shortage, and abstracted effects of the immense British opening barrage by 250 artillery and naval guns. Optional rules include: minefields, mine removal, Luftwaffe nuisance raids (night bombings), inaccurate German rocket artillery (the infamous Nebelwerfers), German signal platoons, and rules for linking chronological scenarios into a single "mega-campaign." Terrain is a mixture of corn and wheat fields, orchards, woods, hedgerows, and small stone farm houses and villages. The map covers the area from le Haut d‟Audrieu and Cristot in the north, to Monts, Noyers and Missy in the south, extending west to Tilly sur Seulles and beyond, and east to Le Haut du Bosq and the outskirts of Cheux. The Germans begin the game dug in, and they may place a limited number of strongpoint markers during setup. A handful of strongpoint hexes are printed on the map; these represent walled farms, châteaus, and manors which are key to the German defense. The Germans are on the defensive overall, but they are armed to the teeth with many powerful panzer formations- including Panzer IVs, Panthers, and Tigers- and will find themselves able to counterattack frequently and effectively. Some of the shorter scenarios feature the Germans on the offensive to recapture lost ground. In general, the German infantry companies start with better Combat Strength and Ranged Attack values, relative to their British counterparts. The terrain heavily favors the Germans as well. But the British enjoy superior numbers, a more lenient recovery mechanic, and extensive offensive support from airstrikes and artillery. Furthermore, the German infantry companies are, on their reduced sides, inferior to the reduced British infantry. This simulates a key dilemma for the German combatants: excellent weapons and technology, but a desperate lack of manpower and supplies. 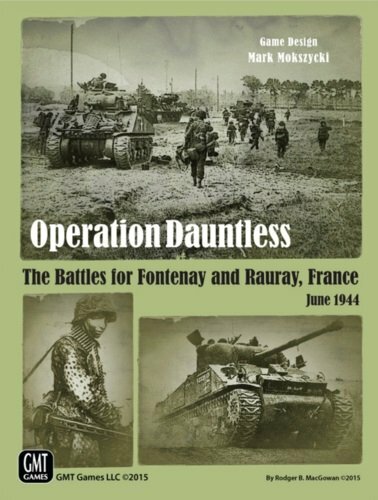 Operation Dauntless was designed for 2 players, but works very well solitaire. The key mechanics of Operation Dauntless are the same as those in Red Winter. 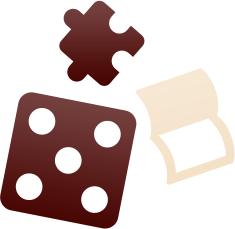 Central to play is the Action Phase, wherein each unit may choose only one from several possible actions: move/assault, attempt recovery, dig in, or take replacement steps. This makes for some very tense decisions for both players. It also conveniently moves the game along at a brisk pace. Both games feature the same uniquely simple unit recovery system. Reduced infantry units may opt to attempt to recover during their turn in lieu of other actions. This requires rolling a "6" on a single 6-sided die. However, units gain a +1 bonus to the die roll for maintaining their distance from enemy units. This provides a simple yet realistic incentive for players to withdraw their reduced units to the rear and move forward fresh units. The Germans receive a -1 penalty to recovery rolls, simulating a lack of replacement troops. 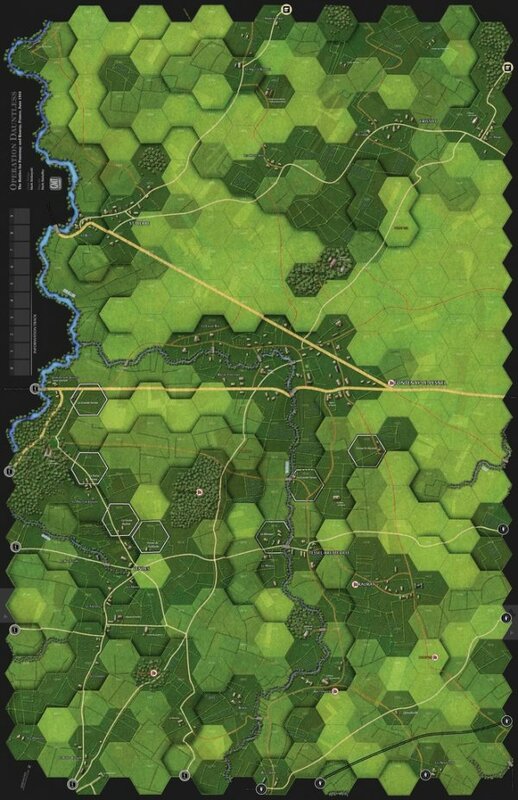 The result, in game terms, is a gradual but noticeable "wearing down" of German units on the map. Another deceptively simple mechanic is used for ranged support. Ranged fire from weapons such as artillery, mortars and machine guns provides a "use it or lose it" benefit to combats against the targeted hex. Thus the attacker will need to follow up his artillery strikes during the very same Combat Phase in order to exploit their benefit, or the suppressed hex will return to normal. No markers or "resets" of any kind are necessary for this mechanic. Combat is fast and well integrated. Units may voluntarily perform combats against adjacent enemies (two-way firefights, which utilize a CRT), conduct assaults as part of movement, or make ranged attacks at a distance of two or more hexes. The "grand tactical" scale of 425 yards per hex yields ranges of 2 hexes for light machineguns, 3 hexes for heavy machineguns, and 6 hexes for medium mortars. British artillery is abstracted, being handled as off-map batteries which can strike any hex on the map. The German player has several self-propelled artillery pieces, including the 105mm Wespe, (Wasp) and 150mm Hummel (Bumble Bee). The British player may allocate artillery barrages without the need to track ammo, while the German player will need to keep a close eye on his ammunition. Anti-tank (AT) fire is handled simply using a pair of 10-sided dice. These are added together and modified by a small number of possible factors: range to target (an easy to remember -1 DRM per hex), penetration (the firing unit's AT rating minus the target unit's Armor), and elevation. While somewhat abstract, the system generates believable results given the unit and time scales involved. Interestingly, AT and Armor ratings represent actual average penetration and armor thickness, respectively, in ten millimeter increments. Thus, a Sherman duplex drive tank with an AT rating of 10 and an Armor rating of 7 can penetrate (roughly) a maximum of 100mm of armor and has an average armor thickness of 70mm. Average armor thickness ratings have been calculated using a simple algorithm which gives somewhat greater weight to frontal armor thickness than side thickness, and somewhat greater weight to turret than hull. Again, this is an abstract approach which generates believable results for platoon-sized armored units. As any tread head knows, not all tank crews and weapons systems are created equal! Simple rules for Fire Control (representing an amalgam of diverse factors including: crew training, experience and morale, targeting systems, optics, stabilizers, rate of fire) lend a further nuance to the armor battles, and show that the penetration numbers aren’t everything. Armored units are classified as FC class Poor, Standard, Good or Superior. Sherman tanks are treated as the standard, and have no special FC rules which apply. Non-standard units may roll additional dice, or reroll a die, according to their FC level. For example, a Panther (classified as Superior) rolls three 10-sided dice instead of two, and then discard the lowest die roll. In this manner, players will quickly come to realize that some units are much better (or worse) than their ratings would otherwise suggest! The game scenarios include the Campaign Game, which covers a three day period from June 25th-27th, plus many shorter scenarios covering various actions from June 16th through June 30th. 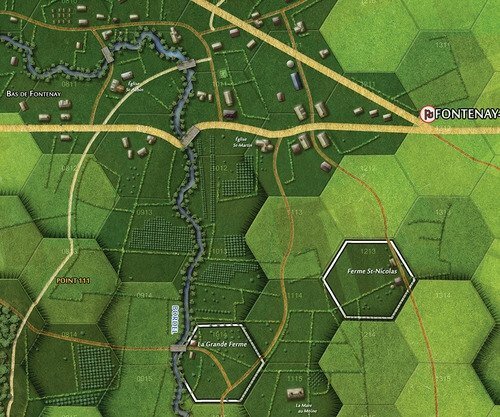 Note that the fighting for Cheux, as well as the German armored counterattack at Point 110 on July 1st, are beyond the scope of this game- although both battles might be covered in future games or expansions, if interest exists. Sklep FortGier.pl oferuje gry planszowe i karciane oraz literaturę historyczną. Powstał w końcu 2011r i swoją ofertę kieruje do wszystkich miłośników rozrywki przy planszy. Swoją ofertę sklep kieruje przede wszystkim do miłośników gier strategicznych, a szczególnie gier wojennych. Do strategów, którzy nad planszą będą chcieli za pomocą własnego umysłu i pewnej dozy szczęścia zmienić nieraz bieg historii. Sklep w swojej ofercie posiada także gry familijne i przygodowe. Dlatego każdy znajdzie coś, co go zainteresuje. Staramy się, aby w naszym sklepie były dostępne tylko najlepsze gry planszowe i karciane, w dobrych cenach. Planszówki przeżywają teraz swego rodzaju renesans, coraz więcej graczy chce wstać od komputera i spędzić miło i ciekawie czas nad planszówką w gronie rodziny czy przyjaciół. Oprócz gier krajowych sklep oferuje także gry zagraniczne, częściowo dostępne od ręki lub możliwe do sprowadzenia na zamówienie. Są to często gry wydawnictw, których ofertę trudno znaleźć w innych polskich sklepach planszówkowych. W ofercie sklepu oprócz gier wojennych dostępne są także książki historyczne, traktujące głównie o historii wojskowości. Naszym zdaniem połączenie gry planszowej z lekturą książki historycznej może tylko podnieść satysfakcję i przyjemność z gry. Nasz sklep z grami siedzibę ma w Warszawie. Tam też możliwy jest osobisty odbiór zakupionych gier. Zapraszamy do zakupów i życzymy wielu mile spędzonych chwil nad planszówką lub przy karciance.